WOW is recognized as one of the leading scenic creators in the northwest for museum quality dioramas and scenic components for interpretive centers. Typically, trees and rocks are molded from the landscape to be interpreted and then sculpted and cast from durable class-A fire rated polyurethane material. From ropes and mats to an encyclopedic collection of trees indigenous to Oregon, WOW recreates nature. ~ The exhibit designers/artists were featured on Oregon Public Broadcasting. 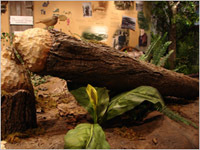 Diorama for Oklahoma Museum of Natural History, Formations Exhibits - Lead contractor/designers. Designers/ creators of artwork, dioramas, and interpretive information - Mill Hotel and Casino North Bend, Oregon. Designers/ creators of diorama for the North Bend Visitor Center, a project of OCEAN and the City of North Bend. Fabrication of exhibits for San Diego Zoo, designed by 1+2 Inc. USFW. Diorama and scenic creators USFW Tualatan Interpretive Center, PPI designers - HB Stubbs, Contractor. Completion of concept, design and fabrication, 'Pathways To Discovery', an interpretive natural history exhibition for younger audiences and those who are young at heart. The exhibit is composed of sensory environments for the Umpqua Discovery Center - Reedsport Oregon. Conceptual design Oregon - Where Past is Present a permanent exhibition for the University of Oregon Museum of Natural History, that presents the extensive collections of the Museum in a stimulating series of sensory environments. Concept, design, and fabrication of 'Tidewaters and Time' for the Umpqua Discovery Center in Reedsport, Oregon. The exhibition was awarded the Frank Branch Riley Tourism Award in 2001. The award is given by the Oregon Historical Society and the Oregon Tourism Council for the outstanding project that brings together Oregon history and tourism. Lead designers for the Coquille Indian Tribe, 'Community Plank house Project'. Designers fabricators of Dunes National Recreation Area USFS interpretive center exhibits. Designers Fabricators of Legacy exhibits for the Coquille Indian Tribe. Interpretive design and fabrication - Siltcoos Paddle Trail, Siltcoos, Oregon. Design and fabrication of exhibits Oakland Historical Museum - Oakland, Oregon. Site specific mural Share The World for Peace Plaza - Salem, Oregon. Site specific interpretive information, artwork and murals Confederated Tribes of Siletz Indians administration building - Siletz, Oregon. Site specific artwork (Murals) - Chinook Winds Casino.